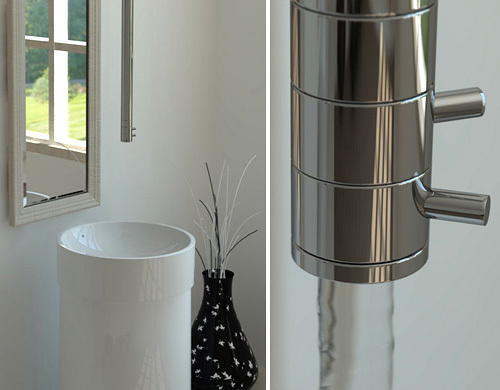 Signorini's Ceiling Mounted Bathroom Faucet | OhGizmo! Even though the installation will probably require quite a bit of renovation to your bathroom, including the re-routing of water pipes, this ceiling mounted faucet from Signorini is certainly a conversation piece. It’s part of the company’s Bilo line, and also features a stylish single lever hot/cold water mixer. And as for the price, well I’m going to assume it’s one of those ‘if you have to ask, it’s probably not in your budget’ items. I think these look nice, but are very impractical. I want a plain jane one, easy to clean… I mean that must get annoying to clean the top of it. Fun, but not something I'd want in my home. As much as I like contemporary stuff, this is not one of said stuff. Imagine the extra labor involved in installation. looks good, but I don't think it's a necessity. My bathroom will be fine without it..